Usually we head to Chelsea for the best selection of Loehmann's designer markdowns, but today we scoped out the Upper West Side location and were pleasantly surprised by the selection of great Italian designer merchandise. Their “Back Room” designer area is replete with Italian labels like Moschino, Dolce & Gabbana, Red Valentino, M Missoni and Philosophy di Alberta Ferretti. Once you hit the Back Room area you will see many impressive racks of Dolce & Gabbana, including a $399 white silky trench coat and black blazers for $299. There are also a couple racks of M Missoni, including a cotton halter maxi for $250 and their charity red print collection for Orphan Aid Africa. Our favorite piece was a trench for $300. Against the wall you will find the dresses and gowns. A Philosophy di Alberta Ferretti lace dresses are priced between $200 and $300. A few knit M Missoni maxi styles are $400 and also Valentino collection gowns are just $1300. Heading downstairs, small sized ladies should really stop by the jeans rack to scoop up $29 J Brands. Otherwise, there are quite a few Emilio Pucci silk scarves for $160, and then some Judith Leiber purses and jewelry in glass cases marked about 50% off retail. We were more stunned to see the other treasures behind glass, including a Chanel matte black J12 for $5500 from $6500. 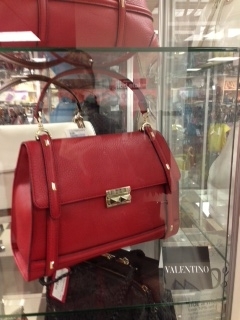 We also spotted several Valentino Rockstud satchels for $1760 as well as a unique large intreciatto Bottega Veneta hobos for $1700. Footwear has an equally good selection, including lots of Giuseppe Zanotti sandals and heels from $300 to $500, Sergio Rossi heels for $300, Dolce & Gabbana and Rene Caovilla shoes are $400 and lots of Casadei sandals starting at $200. Missoni wedges and flats are $250 to $400, although their charity red zigzag flats are just $80. Our favorite footwear was the Valentino rose rain boots for $150 and a flower topped thong jelly sandal for just $130. Remember to get your Loehmann’s insider card so that you can save an extra 20% off all regularly priced merchandise. The additional discount brings those Valentino rain boots down to $120. Can’t imagine a better deal that that.